Hey y'all! A couple months ago I received a request to do a post all about easy, preppy hairstyles. 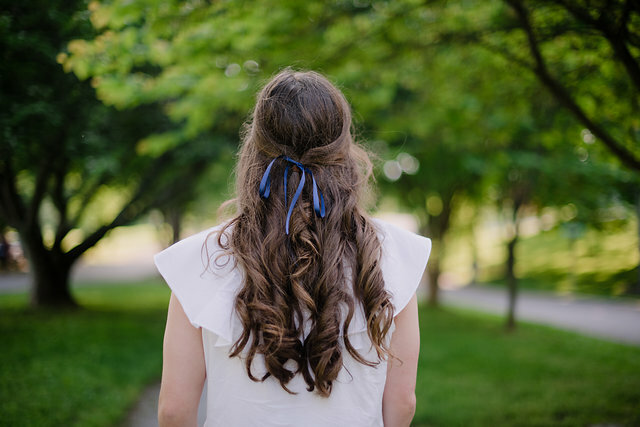 I thought this was a wonderful idea because sometimes it's hard to get inspiration for preppy hairstyles that are easy but also perfect for school. I take a lot of my hair inspiration from the 1950s and 60s- headbands, big curls, and volume. I also look to fashion icons such as Blair Waldorf and Audrey Hepburn. This is the first post out of about 3 I am planning on doing all about hair. 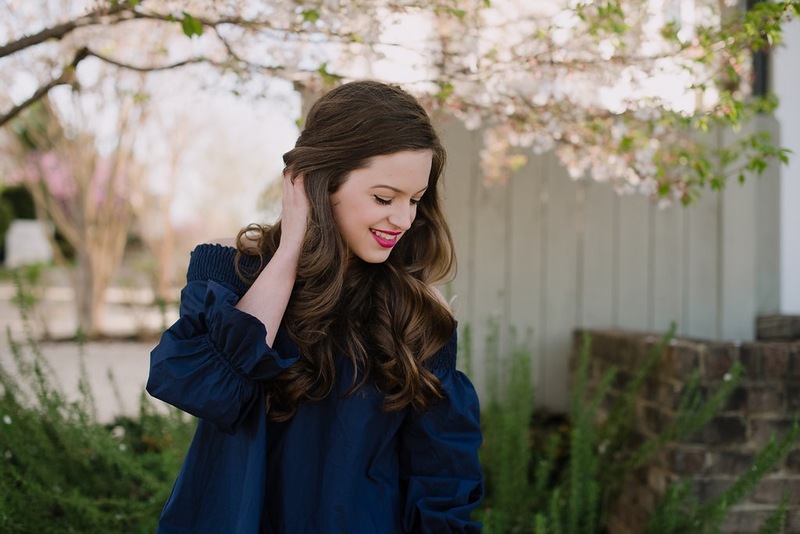 Keep reading to see my favorite preppy hairstyles! I use a curling wand and an iron for curling my hair. I go back and forth depending on what I'm feeling that day. I find that when I curl with an iron, the curls generally don't hold as well as with a wand. Either way, I wrap my hair flat around the barrel of each. I usually don't section my hair off unless I want super bouncy curls. I usually only have 20 minutes to do my hair, so keeping everything on one section is generally the fastest way. After wrapping my hair flat on the barrel, I will keep the hair on the barrel for 5-10 seconds. Then, I will let it go and cup the curl in my hand. I like to tease my hair at the roots along the part to keep everything volumized. I also tousle the curls and brush through them a bit. Now that I have established my not-so-routine curling "routine", here are the hairstyles! This is one of my favorite hairstyles! Seriously so easy and can amp up an outfit so much! First, start with a base of curls (just like all these hairstyles!). 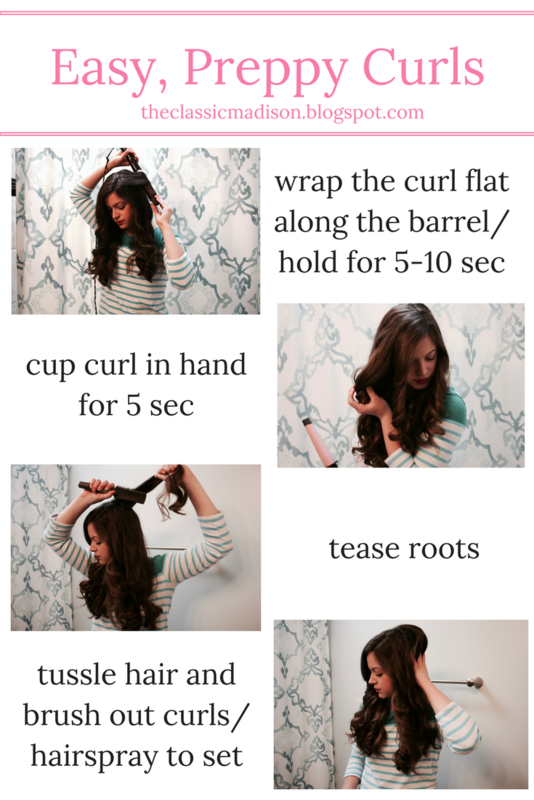 If you are running low on time, curl the hair in the ponytail- this is one of those hairstyles that can be done in 5 minutes! Next, tease the roots of your hair, especially near the crown. This will give the retro volume that makes this hairstyle so preppy. Part your hair slightly to the side. Section off a front piece of hair that will be used later. 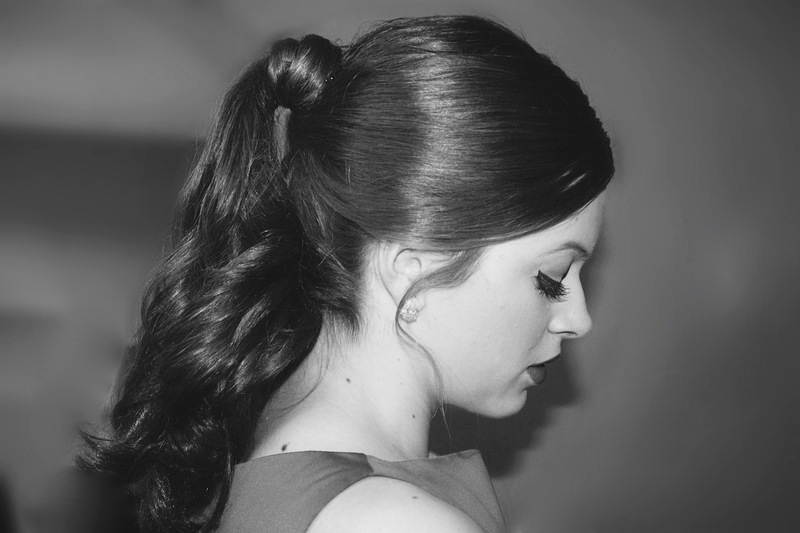 Then gather up your hair into a ponytail, but leave the part in the middle. Now for that first section of hair. Adjust it to smoothly frame your face, then pull it back to wrap around the ponytail holder. Bobby pin in place. This is what is shown in the picture. Pull out some loose pieces of hair, and voila! 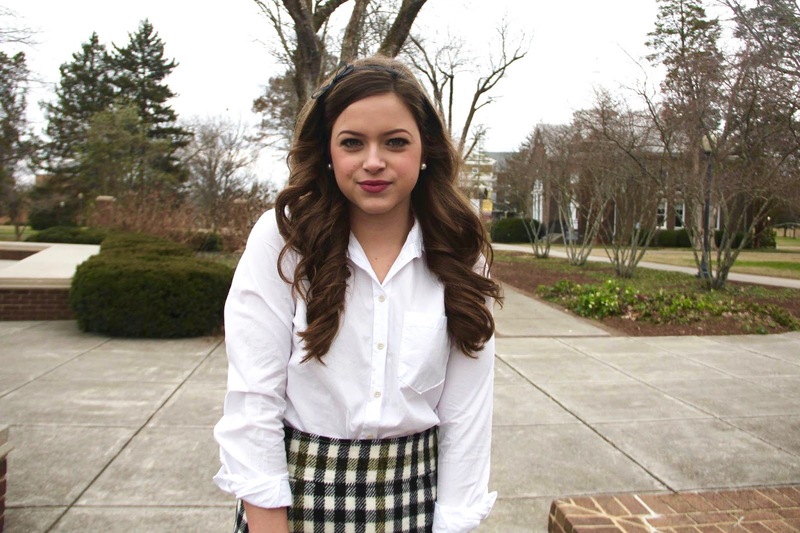 I hope you all enjoyed these super easy preppy hairstyles! I would love to continue doing some of these for you, so if you are interested let me know! I am planning on doing a Brigitte Bardot inspired look this summer complete with an outfit! I also want to apologize for the lack of fashion posts recently. I am currently finishing up high school and I graduate next week. I am working with my awesome photographer for photos, but she is busy as well so it is hard to collaborate and get pics when we are both so busy. I recently shot three outfit looks and I am awaiting the pictures. As soon as I receive them, I will type up 3 posts for you all! 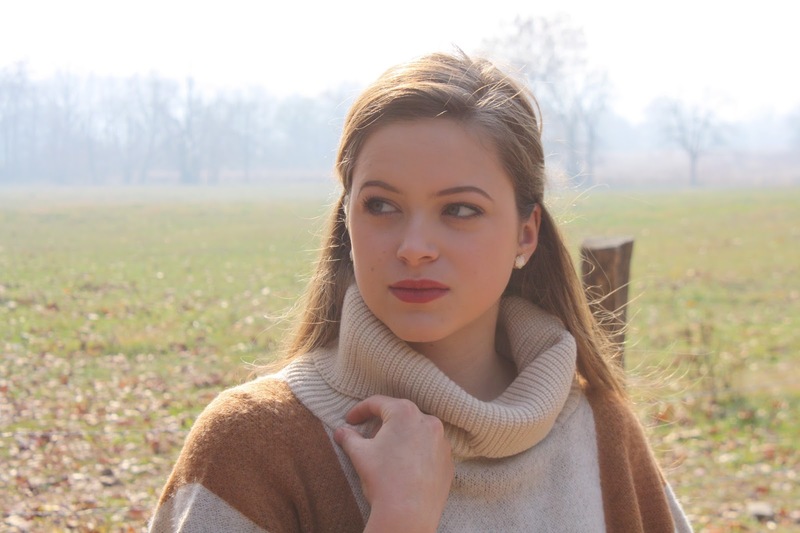 Thank you for your patience as I have been lacking on the fashion side of this blog- which is exactly why I started the blog in the first place. Anyways, I promise this blog will be back on track very soon! I also want to thank Julia from Sunshine State Julia for requesting this post. She requested it all the way back in February! Please go check out her blog!